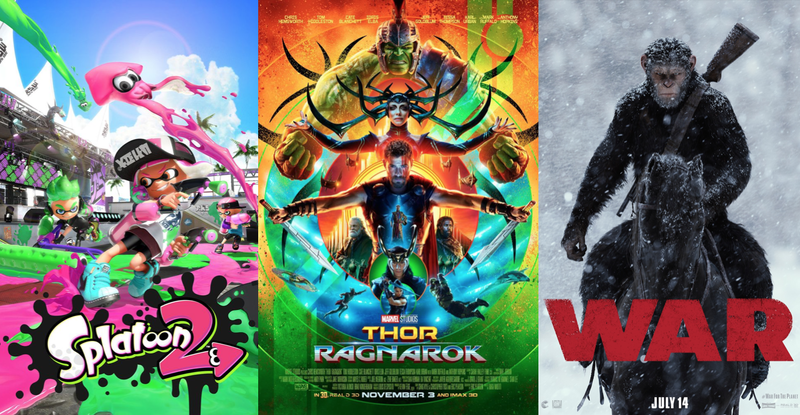 It’s a surprisingly jam-packed episode this week, as we get to talk about a slew of movies, games, and TV. 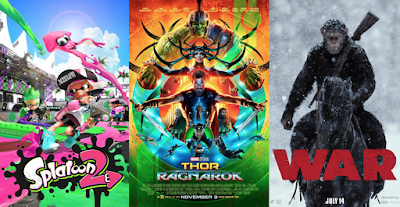 First up is a boatload of news, movie trailers, and more out of San Diego Comic-Con, including more DC shenanigans and an incredible look at Marvel’s Thor: Ragnarok. Then we talk some recent movies, with Jonathan reviewing Christopher Nolan’s Dunkirk and Sean catching up on the recent Planet of the Apes trilogy, leading to a chat about all 3 films including War for the Planet of the Apes. Then we talk about 3 recent (and upcoming) games: last week’s beta for Destiny 2, Jonathan’s thoughts on Nintendo’s wildly fun Splatoon 2 for Nintendo Switch, and Sean’s reaction to the amazing Nier Automata released earlier this year. And finally, we head to Twin Peaks for our latest review of The Return with the casually insane Part 11, an episode chock full of guns, hell portals, and cherry pie. Enjoy, and look forward to the special 200th episode coming early next week! I'm a little sad that you guys don't consider the over 20 episodes of The Monthly Ten and The Monthly Stuff podcasts as "Canon". I feel those shows still hold up and some made it on my 10 favorite episodes of all time list I sent you a while back. I'm happy to have contributed to at least one of your microphone upgrades over the years. Thanks for the show and congratulations on episode 200! Thanks so much Kenny! I'm glad you've been along for the ride and we will certainly never forget the microphone contribution! It has helped our show immeasurably. Speaking for myself, the main reason I don't count the Monthly Ten episodes is that we hadn't nailed down a format and Sean wasn't on all of them. Back then, it was just me experimenting with what a podcast might look like - I hadn't even started this site, and was still working with the Denver Post. The idea back then was I might have a rotating stable of guests. But after some of those early episodes it became clear the show had to be Sean and me - that was the right chemistry to build a show around. So when WGTC Radio started, I think we finally knew what we were doing and what we wanted the show to look like (that's also when we first started weekly shows). I'm really glad you and others have enjoyed those early episodes - but I think we sort of view them as test runs for the actual show. After all, we were still in high school for a lot of those episodes! It feels like a lifetime ago.